Australia’s south eastern coastline is home to an array of unique and fascinating marine life. These organisms have adapted and acclimatised to temperate (cold water) conditions. However, climate change modelling predicts that Australia’s surrounding oceans will warm by 1–2 ⁰C by 2070, with the south east coast of Australia expected to feel the greatest effects due to increased strength and penetration of the East Australian Current (EAC)(on right). 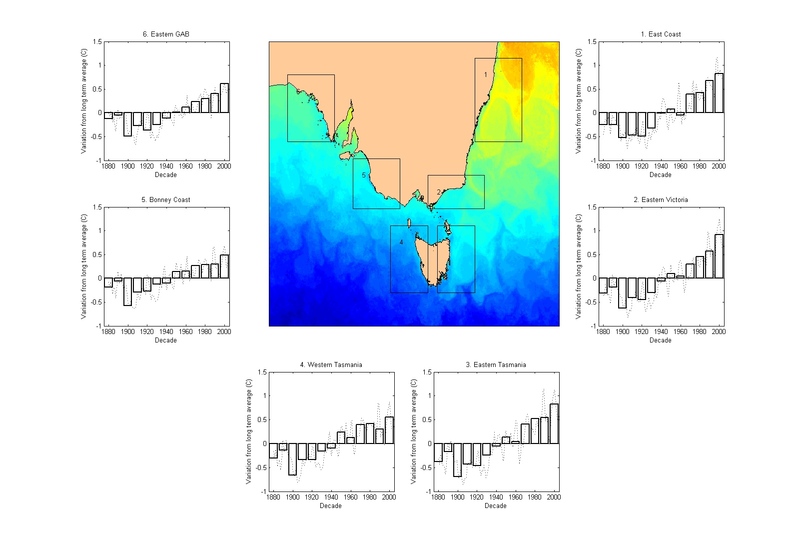 Fig.1 Changes in Sea Surface Temperature (SST) since 1880 for southern and eastern Australia (CSIRO). 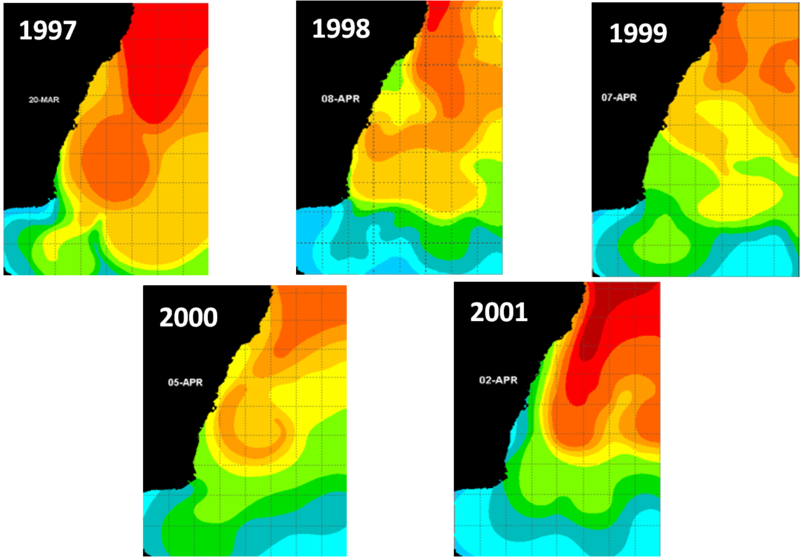 Notice in the graphs, that water temperatures start rising above the long-term average after about the 1960s (Image: CSIRO). 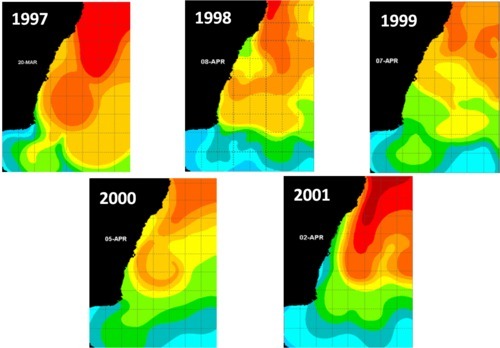 As a consequence to this predicted increase in ocean temperatures, there is mounting evidence suggesting that the geographic range of tropical and temperature coastal fish species will shift to higher latitudes (in this case further South), in response to warming trends. For example, ongoing studies around a coastal town called Merimbula (37°S) have recorded over 50 species of tropical fish which are aided by the warmer water and stronger EAC during Summer/Autumn. It is only when the warm water recedes and cold water replaces it, do these tropical fish die. With the predicted changes, these tropical fish are expected to survive through winter and compete with temperate fish species. In addition to this, structurally important and unique macroalgae (e.g. bull kelp Durvillea potatorum) are predicted to have dramatic temperate fish range shifts. Preferring temperate conditions, increased ocean temperatures are predicted to radically move macroalgae distribution poleward. Warm ocean temperatures influence the health of macroalgae, often leaving large populations vulnerable to disease and wave action. Macroalgae provides important habitats for a number of temperate fish and invertebrate species throughout their life cycles, with predicted poleward shifts, species that require macroalgae habitats will either adapt or follow macroalgae range shifts. Acknowledging these predicted changes, community members are establishing a long term monitoring program to record any annual and seasonal changes in fish diversity and macroalgae health. This would also include recording sea surface temperature. 4. Create an identification/education guide of the target fish and invertebrate diversity and health indicators on macroalgae. At this stage there are two methods to record fish diversity and macroalgae health. 1) Timed snorkel: using a recording template (that will have a list of key fish), participants will note down any fish species they observed and an estimated abundance. They will also note down any macroalgae discolouration. - Species wise: Should we aim to create a total species list and record as much of the biodiversity as possible OR create a targeted species list that aims to record indicator species of fish, invertebrates and macroalgae? - Health: What is the best way to record the health of macroalgae? 3) Is there an online tool or free software to analyse video footage? 4) What would be the best way to standardise video analysis? Note: video footage will be from the same sites taken at different times of the year. This project sounds great! Thank you for posting it. For question 2, one program to look into might be ImageJ. It's a free image analyses program, originally produced by the US National Institutes of Health. I've used ImageJ for all my work with time lapse videos. It's very easy to use, can be easily extended with plugins (written in Java) or using a simple macro language, and is quite powerful. One limitation is that one has to convert video to a tif stack (it can convert Quicktime and .avi files, at least with the right plugins). That means it only works with a few hundred frames at a time due to memory limits. However, if one can deal with just a few hundred frames at a time, it can do do a huge range of things, with lots of analysis algorithms, especially given the existing plugin library. There may be plugins/macros written already to do the random dots which users can label, but it should be pretty easy to write a macro for it. By the way, I added tags "ecology" and "oceanography" so it would show up in the "projects by field" list. Also, it would be great to add info about the sources of those nice figures. Some suggestions from a marine ecologist. 1. Getting citizen scientists to do anything with the label of 'biodiversity' is very tricky - because the data you get will depend ENTIRELY on the training and experience of the participants. So to get 'diversity' data that you can trust, you will likely do much better coming up with a distinct species list, with photos and notes about how to distinguish them, and then try to gather presence/absence or even abundance data about those. 2. Macroalgae 'health' - health is such an unfortunately vague word! They mention color, which is a good idea. One other thing that they might look for - and I would encourage that they establish clear 'scales' for both color and this, is how intact the blades are - eg 'whole', 'frayed edges', 'reduced to stipes' - or some such words, this will depend on the species and what those familiar with them expect. One other metric that might be useful, again depending on the species, is presence/abundance of juveniles - eg are there any Durvillea in the area less than 25 cm total length? Recruitment (loss or gain of) may well be a good 'early warning' of range shifts.